Most of the sicknesses develop due to poor water quality, lack of proper lighting for basking and an improper nutrition. Refer to other sections of this website for information on appropriate housing, lighting and feeding. Swollen eyes. The turtle keeps her eyes closed. 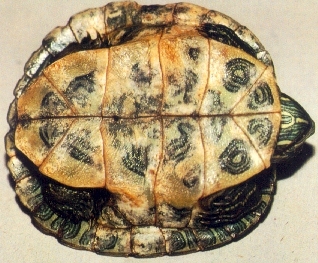 Discolorations or white spots in the shell. Raise temperature to 80 or 85 degrees Farenheit. Keep the water neatly clean. Keep offering different food items to the turtle. Watch out for unusual stools. List of symptoms and possible diseases. If your turtle keeps her eyes closed, they are swollen, and eventually she refuses to eat.. Suspect an eye infection. These infections are caused by dirty water or lack of vitamin A. Change the water more often. Raise the temperature to 80 to 85 degrees Farenheit. Keep the basking light on. You can clean her eyes with a solution of distiled water and 3% boric acid or a solution of distiled water and salt or the old standard sulfamethiazine. Do this morning and night. You might want to use cotton or a q-tip to apply the solution. Try to open the lids so that the solution goes inside the eye. Give your turtle a Reptile vitamin supplement on a regular basis. You can find those supplements in most pet shops. If you see no improvement on the condition of the turtle within 5 days, take her immediately to a veterinarian. Symptoms: runny nose, not keeping the mouth totally closed (or wheezing), swiming tilted to one side, lethargy and refusal to eat. Things to do: (If the respiratory infection is in its early stages, follow this guidelines, otherwise, take her to a veterinarian immediately) Keep the room tightly closed to avoid air drafts. Keep the water warm, this is the most important factor that will alllow your turtle to fight the infection. If you have more than one turtle, separate her from the rest, since infections are contagious. If the condition doesn't improve within five days, take her immediately to a veterinarian. If your turtle seems to have a white cotton like coating over its shell, you might suspect a fungus infection. If the infection is just beggining, you may follow my guidelines, otherwise, if the infection is on a severe state, take her immediately to a veterinarian. To attack mild fungus infections, give the turtle a 30 minute bath of salty warm water everyday. You should start seeing some changes within a couple of days and full recovery within 10 days. If you see that there is no improvement after a week, consult a veterinarian.. 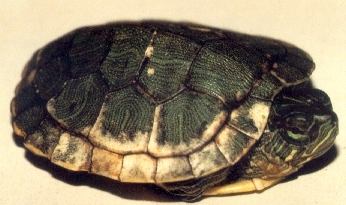 The shell is soft and shows white patches. This is a serious condition caused by lack of calcium and full spectrum lighting. Even if you provide your turtle with calcium rich foods (cuttlebone or calcium supplements), she will not be able to process correctly the calcium without a full spectrum light. 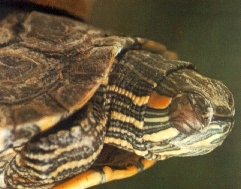 Therefore, to treat this condition, give your turtle a calcium supplement and provide her with a full spectrum light. If you already have a full spectrum light, increase the basking hours. If the softening is severe or you see no improvement, consult a veterinarian immediately. The causes of constipation are in the diet. This is easy to diagnose. If you notice that you have been feeding your turtle and nothing comes out, she might be constipated. The frequency of the stools depends on the frequency of feeding and the types of food taken. As a general rule, if you see your turtle is kicking her tale with her rear leggs and hasn't had a bowel movement for a while, you might suspect constipation. Put her on a container with warmer water than your regular tank temperature. The warmer temperature will induce a bowel movement. If notthing happens, then wait about 5 hours and try again. Vary the diet of the turtle, don't feed her the same item all the time.